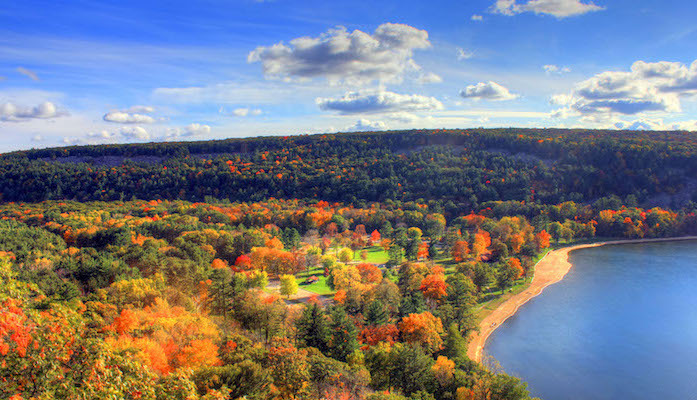 Adventure seekers looking for a challenging trail run just outside Madison should look no further than the Devil’s Lake Loop, an hour northeast of Madison in Baraboo. While there are myriad trails to choose from in the park, the best for running is the 6.2 mile loop around the lake. Park in the main visitor’s lot and head clockwise, following the yellow blazes up the high ridge west of the lake, then back down along the waterfront. It’s a pretty steep stretch of single track, but the views are absolutely worth the effort. The attached park map has detailed information and distances of the various trails.